This Screw-less terminal block adapter is designed for fast and easy connection from DB9 female to spring clamp terminal block wiring for RS-422 / 485 in one small convenient package. Converts the DB9 Male input connected to the Female DB-9 serial port to a terminal block connection for fast easy wiring applications. Supports screw-less wiring with complete RS422 or RS485 data signals. Extremely compact terminal block connector reduces bulky adapters when needed. Easy identification on the adapter for 9 signal pins. 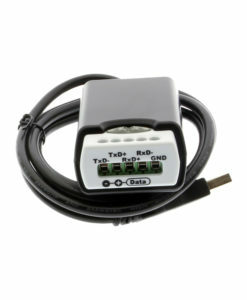 The TB-DB9PIN9 is a DB9 Female to (9-Pin Terminal Block Adapter that conveniently provides an immediate solution to convert a DB-9 Male serial port to a terminal block for fast and easy wiring in RS-422 and RS-485 applications. The screw-less terminal block wiring provides complete Data signals for connecting RS-422/485 field wiring to a serial port. The nine signals of the terminal block are connected directly to the 9 pins of the DB9 female connector. The Terminal Block Wiring is marked on the adapters enclosure to ensure easy signal identification. Power Rating: DB9: 250V, 1.5A.